For its 25th anniversary, Disney brings the Sanderson Sisters back to Blu-ray. A family-friendly tale about three witches terrorizing a group of kids, Hocus Pocus remains a Halloween staple on TV and a nostalgic favorite for many who were kids when it first hit theaters in 1993. Though far from a classic, the flick still holds up fairly well for its intended audience. Serving as a very slight upgrade over the previous barebones Blu-ray release, this new disc basically features the same modest yet serviceable technical presentation while adding a PiP viewing option with vintage behind-the-scenes material. It's very unlikely that fans who already bought the original Blu-ray will find the need to double dip, but if you don't already own the last release, this is the version to pick up. Worth a Look. 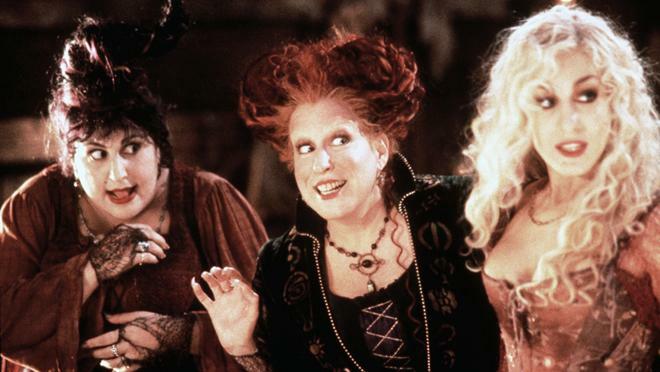 "It's just a bunch of hocus pocus," but what's wrong with that? Absolutely nothing, I say! A fondly remembered Halloween staple for many viewers who grew up in the 90s, Hocus Pocus actually holds up fairly well. Sure, the kid-targeted tale about three evil witches terrorizing children is a little rough around the edges, but the spooky spirit of the flick is strong, and it remains a decent example of family entertainment that doesn't completely talk down to its audience. The cast is very solid, and while pretty thin, the plot offers a fair assortment of thrills and laughs. When cocky teenager Max Dennison (Omri Katz) takes his little sister out trick-or-treating -- she's dressed as a witch, and "for your information, he's a little leaguer!" -- the pair run into Allison (Vinessa Shaw), a classmate that Max has a crush on. Wanting to impress her, he does what any love-struck high-school kid would: accidentally resurrect a trio of three-hundred-year-old witches on Halloween night. Out to drain the city's children of their life force, the three witches (Bette Midler, Sarah Jessica Parker, and Kathy Najimy) first target Max's sister, Dani (Thora Birch). After momentarily thwarting their spell, the kids all make a run for it and are soon joined by an immortal talking cat. Together they try to escape the witches' pursuit and find a way to stop them once and for all. The script follows a predictable and thin path that sees the kids deal with various spooky obstacles and magic spells. Though very basic, to the writers' credit, they do a nice job of balancing family-friendly thrills with a silly, kid-centric sense of humor. Also, despite the intended audience, the movie doesn't shy away from some potentially scary content. Why, in the opening scene alone, a little girl is drained of her life force and three witches are hung. Of course, it's all done with a comparatively light tone, but the filmmakers resist the urge to tone down the content too much. A lot of humor is derived from the witches' fish-out-of-water predicament, and watching the trio grow accustomed to modern life is entertaining. The three sisters have distinct personalities and the actresses appear to have a lot of fun on screen (the way they walk together is quite amusing). Their reactions to the modern world can be pretty funny (even a paved road freaks them out), and their terrified shock at the sight of a little girl dressed up like an angel is priceless. Midler, in particular, seems to relish every second she's on screen, vamping up her presence as Winifred with an appropriately villainous persona. The child actors are also pretty good in their roles. Katz is fairly one-note but appropriately confident, and does a decent job of carrying the forward momentum of the story. 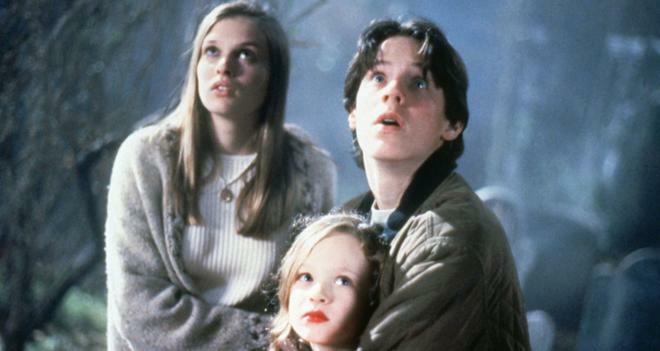 Vinessa Shaw is also good (though her part is underwritten), and Thora Birch is quite adorable as Max's little sister. Together, their relationship forms the heart of the flick, and the brother/sister dynamic is actually kind of sweet. Some of the film's special effects definitely show their age, but a lot of the makeup and even some of the CG work holds up well. I was expecting to be distracted by the talking cat, but for the most part, the feline character remains convincing enough. The witches' resurrection scene is particularly fun with some supernatural effects, and a sequence that involves a zombie pursuing the kids through a graveyard is also full of family-friendly scares and amusing headless stunt work. As surprisingly well as the movie holds up, there are still some glaring issues with the script. It often feels like there are pieces missing from the plot, and a lot of the developments are very convenient (how did the kids know the witches would meet them at the school?). The characters could have been fleshed out more and the drama feels like it needs an extra beat or set piece here and there. Of course, it's kind of silly to hold a children's film under such scrutiny, but these issues do damper the movie's appeal to adults. 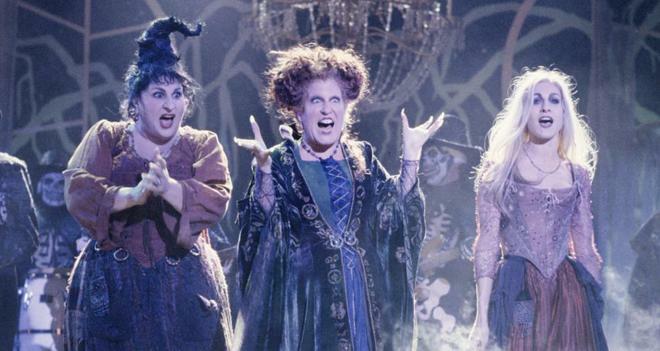 Hocus Pocus has oddly grown in popularity since its release, and remains a Halloween staple on TV every year. It's not exactly a children's movie classic, but I've always been quite fond of the film. Before reviewing this disc, I hadn't seen the movie since I was a kid, and while a lot of the script's shortcomings are much more apparent now, I actually still had some fun with the flick. Fellow viewers who grew up in the 90s might want to check this out for the sheer nostalgia factor, and parents looking for a silly, family-friendly "horror" movie to show their kids should definitely give it a shot. 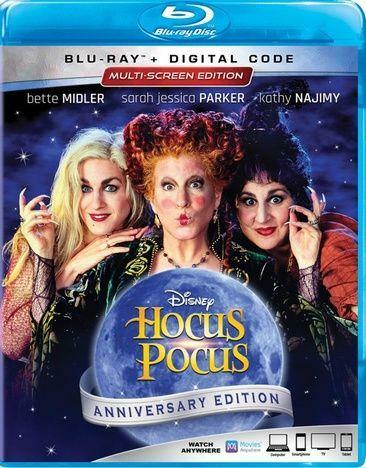 Disney presents Hocus Pocus: 25th Anniversary Edition as a Blu-ray/Digital combo pack. A BD-50 disc and instructions for a Movies Anywhere digital copy are housed in a keepcase. With that said, the DVD copy featured in the previous release is no longer included. After a language selection screen and some skippable trailers, the disc transitions to a standard menu. The packaging indicates that the release is region A, B, and C compatible. A Best Buy Exclusive SteelBook and a Target Exclusive Edition with a 40-page gallery book are available as well. Brightness and color may have been tweaked ever so slightly, but for all intents and purposes, this appears to be the same 1080p/AVC MPEG-4 transfer found on the previously released Blu-ray. And though far from demo material, the modest video presentation gets the job done. You can read my in-depth thoughts on the video from my previous review HERE. Like the video, this appears to be the same DTS-HD MA 5.1 track found on the last release. And again, while unlikely to give your speaker setup a workout, the mix suits the material well enough. You can read my in-depth thoughts on the audio from my previous review HERE. Offering a welcomed but not revelatory upgrade over the previous barebones Blu-ray, Disney has actually included a few bonus features this time around. That said, since this is the flick's 25th Anniversary release, it would have been nice for the studio to offer some kind of retrospective piece with new cast & crew interviews. Instead, all we get is vintage material. We ♥ Hocus Pocus: Trivia and Treats Edition (HD) – This feature activates a PiP mode throughout the movie with vintage interview snippets from the cast & crew, concept art, storyboards, fun facts, and trivia. Likewise, a couple of brief deleted scenes are played as well, along with descriptions of a few more that are sadly not included. Original 1993 Production Featurette (SD, 5 min) – This is a vintage featurette from 1993 with some short cast & crew interviews and behind-the-scenes footage mostly focused on the special effects. Hocus Pocus isn't exactly a family film classic, but it offers a fair amount of kid friendly thrills and laughs. The plot is very basic and thin, but Midler, Parker, and Najimy are memorable in their roles, and the child actors are very solid as well. For its 25th Anniversary, Disney essentially ports over the same modest yet serviceable video and audio from the last release, while adding a solid PiP viewing mode and a vintage featurette. Though far from the packed special edition some might have been hoping for, the bonus content does makes this a better buy over the old disc. With that said, only really big fans will find the need to double dip. Worth a Look.